A fond farewell to the Old Spaghetti Factory on its final day of operation. The restaurant has operated out of the Ainsworth & Dunn Warehouse building, a Seattle Landmark, since 1970. The venerable brick and timber building was designed by architect Stephen Alston Jennings in 1902 for Ainsworth & Dunn, a salmon-packing company. Proposed redevelopment to the site may include a six story mixed-use building situated in the south parking lot, and an additional story atop the existing warehouse building. Note the arched entry on the south elevation is not original, it was added in the 1970's. The large doors on the west elevation originally served as loading docks, in convenient proximity to the railroad and Pier 14 (now Pier 70). Artist Pat De Caro's Foreign Shores Exhibition at Gallery4Culture. Artist Pat De Caro shares insights into her recent show, Foreign Shores, which included over 80 charcoal drawings and was exhibited at Gallery4Culture in Seattle, Washington. RevitalizeWA Preservation and Main Street Conference, Chelan, Washington. Chelan architect Larry Hibbard (far left) leads the “Keeping Buildings Alive” tour past Riverwalk Park with Chelan Butte in the distance. The recovering hills were blackened by the Reach fire less than a year ago. I recently attended and photographed the RevitalizeWA Preservation and Main Street Conference, sponsored by the Washington Trust for Historic Preservation and Department of Archaeology & Historic Preservation. This year’s conference was held in Chelan, and included a visit to Waterville. Highlights of the downtown Chelan tour included the oldest permanent structure in town, St. Andrew’s Episcopal Church, the Chelan library (a converted Masonic Temple), and the Ruby Theatre, owned and operated by Larry Hibbard and his wife Mary Murphy. 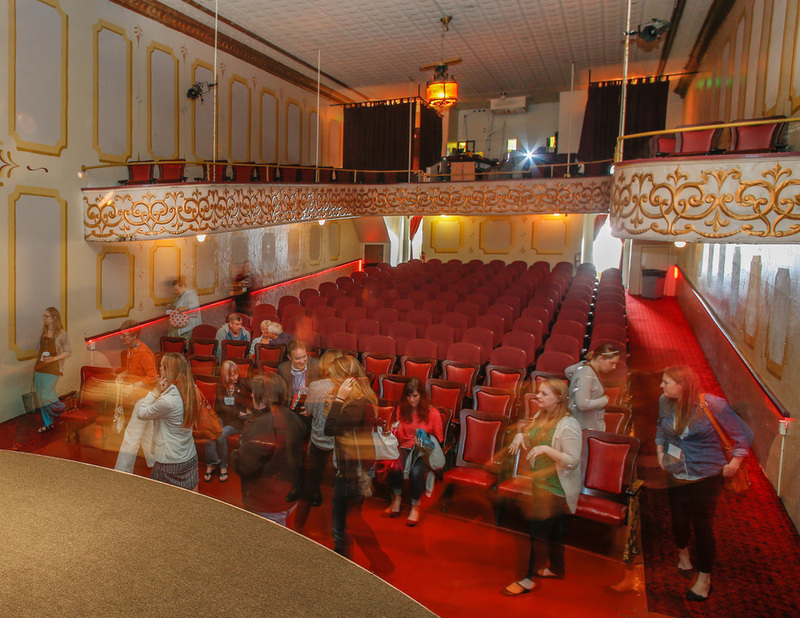 Touring the historic Ruby Theatre, Chelan, WA. Although the Ruby is over 100 years old, it is remarkably intact due to a lack of major structural renovations over the years, which lent it to being placed on the National Register of Historic Places in 1991. It was not Chelan’s first movie theatre however. That distinction belongs to the defunct Gem Theatre, which, as a predecessor to modern theater design had only benches for seats and a flat floor. When built in 1914, the Ruby introduced such modern innovations as sloped seating, a projection room, and central heating. Caryn Hansen Georgen (L) Ruby Theatre supervisor, serves up some delicious popcorn. We take for granted a visit to the concession stand when we go to the movies today, but they were not always part of the show. The nickelodeons that were popular between 1905 and 1915 did not have concessions, but one could purchase popcorn from a vendor working the aisles, or from a snack shop outside the theater. Neither did the more lavish movie palaces that replaced the nickelodeons feature concessions, snacks being considered antithetical to the posh vibe of the movie-going experience. It wasn’t until the 1930’s, with the advent of more modestly built movie houses that the concession stand as we know it today became an integral design element of the movie theater. Architect Larry Hibbard in the projection room of the Ruby Theatre. Post nickelodeon era projection rooms were necessitated out of concern for fire safety due to the combustible combination of nitrate motion picture film (celluloid) passing through the projector in close proximity to carbon arc lamps that could burn at extremely high temperatures. Fires, such as that depicted in the 1988 film Cinema Paradiso, were not uncommon. Due to its flammability and tendency to degrade over time, celluloid based film stocks were gradually phased out and eventually replaced with acetate (safety film) by 1952. 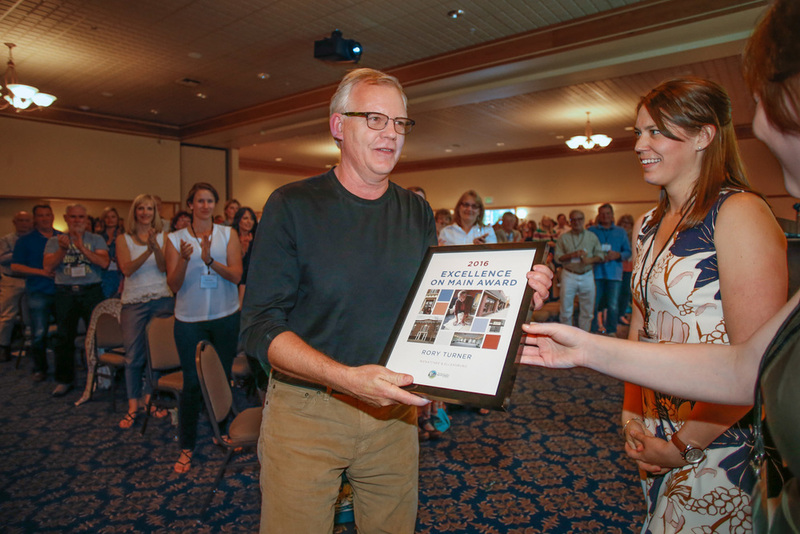 Rory Turner, receives the 2016 Excellence on Main Award from Breanne Durham and Jennifer Mortensen for his preservation and restoration work of the Elks Lodge in Ellensburg, WA. South elevation detail of the Nifty Theatre (1919) in Waterville, WA. The Nifty Theatre is adorned with a barn quilt as part of a countywide all-volunteer project coordinated by Barn Quilts of Douglas County. Each unique quilt pattern, painted on signboards and affixed to barns and houses, reflects a personalized family design. The project aims to honor Douglas County heritage, beautify the landscape, and help boost tourism. Looking south on E Woodin Ave toward Chelan Butte. During my stay in Chelan, it became apparent that there existed among the townspeople a laudable, yet indefinable “calmness of spirit” which beckoned my contemplation. Upon reflection, my belief is that the mettle vitally called forth to confront the Reach Fire, which had burned its way down Chelan Butte to the town’s edge only last August and left this rural community without power or communications for a week, had also left these townsfolk with a trade-off, which I would admirably call: “perspective”.